The T3 has evolved into the T300. Home > News > News > The T3 has evolved into the T300. News: The T3 has evolved into the T300. The highly popular T3 Tennant walk behind scrubber dryer has evolved into the Tennant T300. The latest technologies have been applied to the Tennant T300 ensuring that the T300 is at the forefront of cleaning machine development. The popularity of the Tennant T3 was partly down to its versatility. The T300 offers the same versatility but its components have been enhanced through the use of the most up to date technologies. One of the most significant updates from the T3 to the Tennant T300 is the option to have an on-board video screen. The video screen makes it simple for the operator to use the T300 with little training. It also allows “zones setting and “flow controls” to be created. 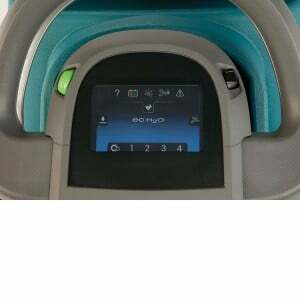 Both help with allowing the operator to maximise the efficiency of cleaning and reduce the need for secondary cleaning. Saving both time and money. The Tennant T300 also has a “Quiet Mode” option which reduces noise levels and allows day time cleaning without disruption. The introduction of yellow “touch points” and “Insta Click” scrub deck allows easy maintenance as the replacement pads and brushes can be “clicked” into place easily and quickly. These additions make it even simpler for the scrubber dryer to be kept in optimum condition. 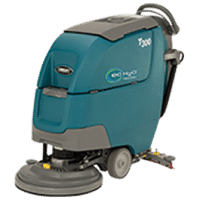 As with the T3 the T300 has ec-H20 NanoClean technology which allows the floor scrubber to be used without the need for chemicals, thus reducing the consumption of daily floor cleaning detergents and their environmental impact. The Tennant T300 has retained the great qualities of the T3 floor scrubber dryer such as its ease of use and versatility but offers truly useful and notable improvements which enhance the cleaning experience for the operator. Click T300 to view more product details.